First things first, Edge of Tomorrow is a really, really good film. Despite how dumb you thought the trailer looked or title sounded, Doug Liman’s action version of Groundhog’s Day was a smart and enjoyable film. You look past the initial set up of why the day resets and you focus on the plot and story at hand, and you get a movie that leaves you on the edge of your seat. Sure it’s a summer blockbuster, but it’s a smart, funny, and well-crafted summer blockbuster. I thought the film was so good I put it in my top 10 films of 2014, and I wasn't the only one. The master of pretentiousness Wesley Morris had Edge of Tomorrow as his 6th best film of last year. Edgar Wright, Collider, and The Washington Post all also had Edge of Tomorrow in their top 10 with many more praising the film but having it just miss the cut. The film has a 71 on Metacritic and a 90% on Rotten Tomatoes. 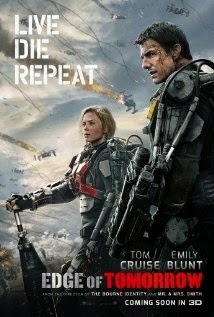 Moral of the story: Edge of Tomorrow is just an excellent movie that you should watch if you haven’t already. If you have, then watch it again. The real question boils down to this: Why does a film like Edge of Tomorrow deserve the prestigious Academy Award nomination? On first blush this answer is simple: action flicks like Edge of Tomorrow just are not good enough to be lumped in with the highfalutin flicks like Foxcatcher or Selma. These films are true works of art and a film like Edge of Tomorrow is just beneath them. That may be how The Academy views action films in general, but this is a result of institutionalism rather than judging the best from the best. When you actually look behind that reasoning you see there’s nothing there. Good is good no matter what the genre is and there is absolutely no reason you can’t compare a film like Edge of Tomorrow or Guardians of the Galaxy to a film like American Sniper or The Grand Budapest Hotel. If a film truly is one of the 8 -10 best films of the year, then it deserves a nomination for Best Picture. Further, with movie studios getting more in the business of becoming an outlet for superhero films and action flicks, The Academy should get right on board as well. Grantland’s Mark Harris wrote an excellent piece about how he predicts big budget action flicks will kill off prestige films just because studios will neither have the time nor the money to invest in those riskier projects that are Oscar contenders. While I disagree with Harris (as I’m want to do) and I think he conveniently glosses over the point that the cream will always find its way to the top ("At this point, optimists usually say lighten up, because, after all, good movies always find a way to get through. But here’s the thing: They don’t.") I do think that as we progress more towards the dominance of Marvel and DC in our theaters, The Academy should also see such a reflection. The reason films like Marvel's The Avengers and its progeny are so successful is because that’s what we want to see. The reason that The Dark Knight and Marvel’s The Avengers and The Hunger Games flicks top the Box Office every year is because the masses love them. And they love them because they’re good. I also believe that many of these Lower Class action films are much better than these High Class Oscar worthy productions, Many times what is considered Oscar-worthy is really just code for "boring" and "paint-by-numbers sap." Recent Best Picture nominees like The Theory of Everything, Philomena, Lincoln, and War Horse and recent Best Picture winners The King's Speech, 12 Years A Slave, and The Artist prove that The Academy clearly doesn't know what they're talking about most of the time. Rather, the collection of old, white, male voters that mainly make up The Academy aren't really the best judge to determine what makes a film truly the best of the year. While there certainly is a loud and vocal minority of young voters to nominate films like Whiplash, District 9, and Django Unchained. it doesn't seem to be enough. There's no reason incredible films like Looper and Drive get essentially shut out at the Oscars while films like Hugo and Dallas Buyers Club get praises and Academy wins showered upon them. The reason I believe it is so important to inject much needed youth is because a younger generation will nominate and vote on winners that will truly stand the test of time. You didn't need to go that much younger than the Academy norm to realize The Social Network was an infinitely better film than The King's Speech. The only reason we even remember or discuss films like Dances With Wolves, Shakespeare In Love, or The English Patient is because they won Best Picture. The reason we remember Goodfellas, Saving Private Ryan, and Fargo is because they are some of the greatest movies ever made. The Academy's particular brand of film that they like and think is good is the reason more crappy films get made. Generally speaking, actors and producers crave immortality with an Oscar win so they create projects they know The Academy will like which in turn just creates more bad movies. 2014's The Theory of Everything is the perfect example of this terrible cycle. This film is extremely dull and boring and nobody should watch it. The very moment The Theory of Everything was announced it was already deemed to be an Oscar player. Eddie Redmayne gives a pretty bad performance as Stephen Hawking in the film, but because it's one of the basic types of performances The Academy can't help but fall in love with, Redmayne is probably going to win am Academy Award. The only reason The Theory of Everything exists is to win awards and I'm dumb enough to buy a ticket for garbage like it just because it was nominated for an Oscar and thus is in the public conversation. Instead I should be handing over my hard earned cash for movies that are both good and that I want to see. This can be helped by The Academy nominating actions films like Edge of Tomorrow. Not only will this create a cycle for studios to start creating better actions flicks, but it will reward true talent and excellence and not just the appearance of it. What's worse is that it's not like this governing body hasn't given major awards and nominations to superhero and actions films in the past. Star Wars was rightly deemed one of the five best films of 1977. All three Lord of the Rings films earned a Best Picture nomination with The Return of the King earning a win. Crouching Tiger, Hidden Dragon, The Fugitive, and Avatar could all be classified as an action movie and all have been nominated for a Best Picture Oscar. While Christopher Nolan's The Dark Knight did not earn a Best Picture nomination, its snub is considered the main reason we have the 8 -10 Best Picture nomination system today. A few years later, Christopher Nolan’s action/adventure epic Inception earned a Best Picture nomination. The Academy is not ashamed to nominate and reward action films, but they unfortunately do not want to do it with any sort of regularity. If films like Spider-Man II, The Dark Knight, and Guardians of the Galaxy all received a Best Picture Academy Award nomination, especially in a system where more than five films earn a nomination, would anyone really be upset? In 50 years, will we look back on these nominations and write angry blog posts (or whatever medium we're using in the future) complaining about these action films? I don't think so because at the end of the day we just want The Academy Awards to get it right. We want the 8 - 10 Best Picture nominees to actually be the 8 - 10 best pictures of that given year- and I don't think that is an unreasonable request to ask. By having films like Edge of Tomorrow garnering Best Picture nominations, we can look forward toward a more progressive and a more fairly represented Academy Awards. I agree that it looks really bleak where someone like Alejandro Gonzalez Inarritu needs to beg for $18 million or Dan Gilroy struggles to scrape together $8.5 million, but I do not believe that difficulty equates to death. I look at an artist like Damien Chazelle who needed only $3 million to make his masterpiece Whiplash and I think there will always be Damien Chazelle's out there. I also believe directors will adapt. Zach Braff just got to make the movie he really wanted to make thanks to crowd sourcing. I also think with the rise of Netflix, YouTube, and iTunes and the decline of movie theaters is only beneficial to auteurs. If anything, it will weed out the weak directors and only the strong and best will survive. WHAT ARE YOUR THOUGHTS ON THE CURRENT STATE OF FILMS THAT CURRENTLY RECEIVE A BEST PICTURE ACADEMY AWARD NOMINATION? DO YOU THINK FILMS LIKE EDGE OF TOMORROW DESERVE MAJOR OSCAR NODS? LET US KNOW ON OUR FACEBOOK PAGE!